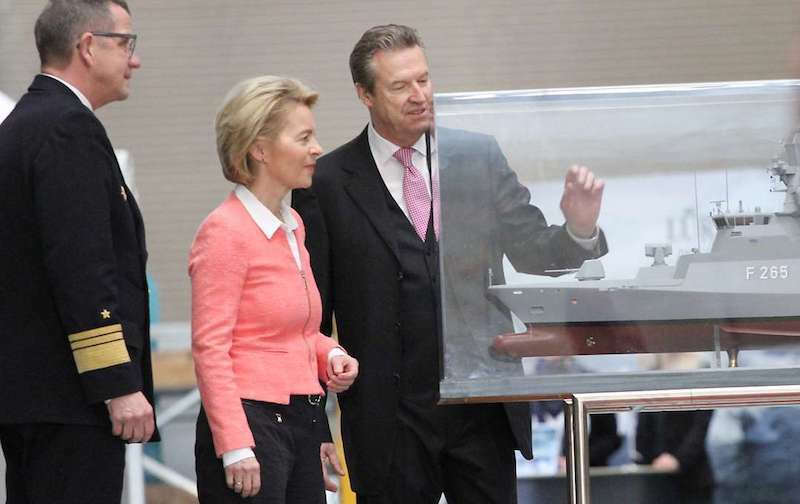 “Today is a great day for the Navy“, said German Minister of Defense Ursula von der Leyen, minutes before she symbolically lauched the first steel cut of the new K130 Corvette Köln. This 2.5Bn€ additional order of an in-service warship type is expected to be completed in 2026. In September 2017, the German Federal Office of Bundeswehr Equipment, Information Technology and In-Service Support of the Bundeswehr (BAAINBw) awarded this contract to a consortium consisting of Lürssen Werft, ThyssenKrupp Marine Systems (TKMS) and German Naval Yards. This showed that « the Bundeswehr can implement large projects quickly and flawlessly. 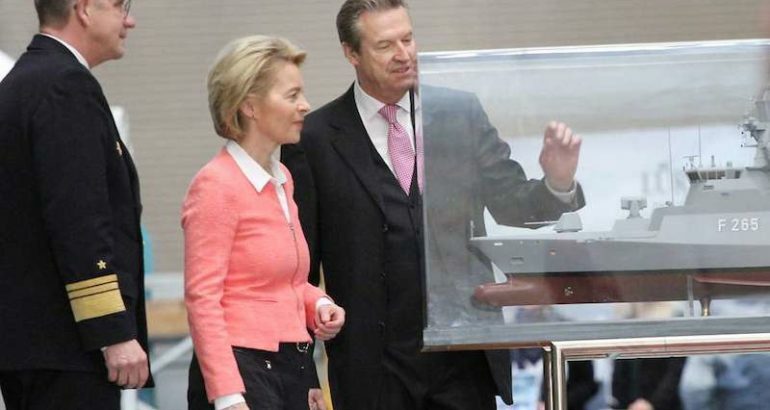 That’s good, if it happens like that », added von der Leyen. Next milestones are the keel laying in April of this year, the completion of the fore and aft sectiosn of the ship next year, and the first builder sea trials in August 2022. The Bundeswehr expects a delivery of the Köln to the German Navy in November of the same year. “I am pleased that with this day, the ‘turnaround material’ has arrived in the Navy,” said the Inspector of the Navy (Chief of German Navy), Vizeadmiral Andreas Krause. Germany approved the procurement of five additional Braunschweig-class (K-130) corvettes in June 2017 to answer new NATO requirements. The second batch of corvettes will be named Köln, Emden, Karlsruhe, Augsburg, and Lübeck. Atlas Elektronik and Thales Deutschland have been contracted to deliver the combat system for the five new K130 corvettes. As Naval News previously reported, the BAAINBw selected two sensor systems for the future K130 Batch 2 Corvettes of the German Navy. Identification, friend or foe (IFF) systems. The systems will be fitted on the 5 K130 corvettes (ships 6 to 10) of the second batch. The additional (6th and 7th) systems are intended to be fitted on a shore based facility for testing purposes. The estimated total order value is 85 million Euros. Electro-optical systems as well as installation and integration services including necessary maintenance. The contact includes an option, for the delivery of 10 additional systems for the existing K130 corvettes of the first batch (ships 1 to 5). The estimated total order value is 58,34 million Euros. First pictures of the K130 Batch 2 also suggests that the future ships will receive the latest variant of the 76mm main gun by Leonardo (with a stealthy shield, while existing K130 main guns have a round cupola). Existing K130 Corvettes weapon systems include four Saab RBS-15 anti-ship missiles, two 21-cell RAM surface to air missile systems, an Oto Melara 76/62 gun and two Rheinmetall MLG 27 guns.